Golden Triangle RC&D and NRCS have a common purpose of helping to bring about the conservation and sustainable use of land, water, wildlife, and related resources. In September of 2015, Golden Triangle signed a three year contract with NRCS to provide technical expertise to landowners in Southwest Georgia for the development of Conservation Plans. Golden Triangle RC&D visits landowners identified by NRCS, completes conservation plans, and enters the plans into Toolkit. Golden Triangle promotes the importance of conservation planning and encourages landowners to contact NRCS through our normal activities and speaking opportunities. All assistance provided by Golden Triangle RC&D meet USDA NRCS standards and specifications as set forth in the Field Office Technical Guide. A conservation plan is a tool designed to help you better manage the natural resources on your farm. 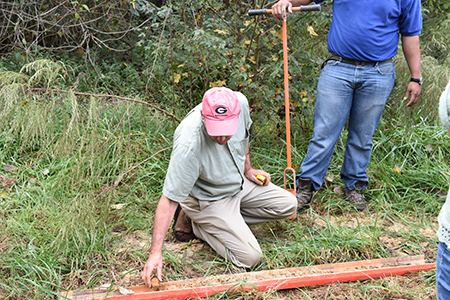 Through a cooperative agreement with NRCS, Golden Triangle visits with landowners identified by NRCS to help evaluate their property and their resource concerns. The alternatives the landowner decides to use are recorded in a conservation plan which includes a schedule for installation. Implementing the conservation plan helps the landowner protect the environment on and off their farm. Possible eligibility for USDA farm programs.